The Short Version: A century ago, when the world was at war, one organization began a mission for peace. In 1917, the American Friends Service Committee (AFSC) was founded to give non-violent Quakers a way to help in the global crisis without joining the military. Instead, these Friends aided victims of WWI by driving ambulances, administering to wounds, and rebuilding towns. Today, the AFSC operates in over 50 locations worldwide with 200+ workers and volunteers from various groups advocating for social issues like immigrant rights, humane prisons, and world peace. The organization brings people together under a common cause and gives them the resources to support their religious ideals in peaceful protests and humanitarian efforts. 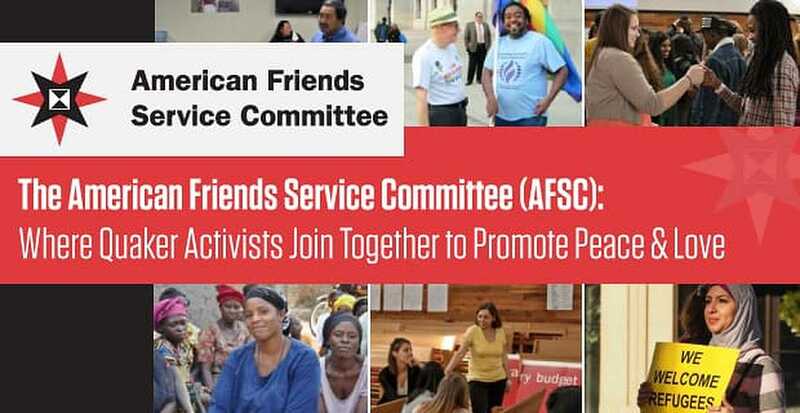 While serving communities at home and abroad, the AFSC’s peace-loving activists meet many kindred spirits who are on the same journey to make a difference in people’s lives. Inspired by their faith, the American Friends Service Committee shows love for all humanity without reservations or borders. Celebrating its centennial year, the charity touches the lives of people across the world and in their own neighborhood. 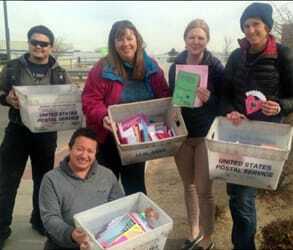 The AFSC’s Valentine’s Day cards send loving messages to hundreds of immigrants facing incarceration or deportation in Denver. The Friends went to the GEO Detention Center to deliver several boxes of colorful cards written in English, Spanish, and Creole. Some letters were sent from the children of people in custody, while others were penned by a compassionate stranger. “Our Valentine cards are a way of telling Haitians and Latinos they’re not alone nor are they forgotten,” said Lori Hermanson, who joined AFSC’s letter-writing project. For over 100 years, the AFSC has upheld Quaker beliefs in nonviolence and fellowship by doing good works in the U.S. and abroad. If you’re looking to meet people who share your values, you can join AFSC’s efforts toward peace, justice, and love. Because AFSC members work closely together on many heartfelt humanitarian projects, they often form tight bonds — and sometimes even lifelong partnerships. AFSC supporters Jean and Cliff Lester met and fell in love in 1953 while volunteering at a work camp in Tlaxcala, Mexico. The now married couple have since dedicated their lives to supporting the cause that brought them together. From building houses in Mexico to delivering messages of sympathy in Colorado, the AFSC reaches out to people of all backgrounds, believing in the common humanity that unites us all. You can find out how you can get involved and be a force for healing and change in your community. The American Friends Service Committee formed in 1917 “to give young conscientious objectors a way to serve without joining the military or taking lives.” Quakers are morally opposed to fighting and killing, but they are helpers at heart and can’t resist a call to serve. During WWI, American Friends decided to serve their country, and humanity as a whole, by driving ambulances, administering to the wounded, and working to rebuild war-ravaged communities. “You will carry with you the honor of the Quaker name and of the American Red Cross,” said T. Edmund Harvey, who led the English Friends’ Expedition to work on reconstruction in France. Sometimes, the workers would see the houses they rebuilt torn down again by wartime activity, but they never wavered in their mission to help and heal. In World War II, Quakers again found ways to help the efforts of American soldiers without committing acts of violence. Some men served as human guinea pigs for scientific experiments on nutrition, lice, starvation, and disease, sacrificing their own health to help the military care for soldiers overseas. In 1947, the AFSC and British Quakers received the Nobel Peace Prize for their efforts to rebuild Europe and oppose war. This organization was built upon activism, empathy, and service, a proud legacy which has persevered through military conflicts, civil rights movements, and political upheaval. Today, the AFSC represents a far-reaching community of helpers in 41 U.S. offices and 16 countries, including Haiti, Mexico, Somalia, and North Korea. If you share the organization’s values and want to defend goodness, peace, and compassion, you’d do well to join the strong network of principled Quakers and their allies. AFSC members, united by faith and friendship, strive to make a difference through positive social action. AFSC has various internship and job opportunities for anyone committed to the cause of peace and justice. Every year, AFSC admits more than 100 fellows, interns, apprentices, and volunteers who “believe there is worth in every person and that love can overcome violence and injustice.” You can develop your leadership skills, expand your horizons, and build bridges of understanding in communities around the world by joining the AFSC’s ranks. “We feel it’s important to catch young people at an age when they’re idealistic and want to do something to help the world,” said Jean Lester, a donor who met her husband through AFSC. The organization’s website also posts frequent Action Alerts calling on Friends to speak out on a certain issue by joining a protest, writing to Congress, signing a petition, or attending a community event. Some of their educational projects are stunning visuals like the AFSC Eyes Wide Open traveling exhibit, which displays hundreds of soldiers boots to represent the fallen in Iraq and Afghanistan. Other efforts are more based in real-world activism, like the Wage Peace Campaign, to challenge militarism and build peace-loving coalitions in diverse communities. You can find AFSC events near you on their calendar. Don’t forget to pay particular attention to their centennial-themed events. Over the years, the AFSC has helped families stay together through times of conflict and crisis like one couple facing the draft during the Vietnam War. “After an examination, my fiancé received a medical discharge. I could not have done that without the help and support of American Friends throughout the process,” recalled Joanne Schullo, a Gainesville resident who received draft counseling from AFSC. From giving medical relief and hot chocolate to families fleeing a war-torn Germany to welcoming Syrian and Iraqi refugees with a hot meal in the U.S., the American Friends Service Committee supports the marginalized and the downtrodden wherever they might be in the world. This organization’s compassion has no borders, and they encourage others to take up their cry and join the movement toward a more loving society. The AFSC organizes their blog posts into three main outlets: Acting in Faith, which promotes the work of the AFSC; News and Commentary, which reports the latest developments in the fight for peace and justice; and Media Uncovered, which offers opinions, research, and analysis of the current political climate. Together, these blogs provide a comprehensive look at major problems in the U.S. and what AFSC members can do to resist. They view their work as a “practical expression of faith in action” where spiritual beliefs translate into real-world efforts to transform social relations, laws, and systems. You can read more about these issues here. This nonprofit organization provides plenty of resources to motivate people into social action. Whether you want to stay informed for your own sake or for the sake of someone you wish to impress, the AFSC blogs provide detailed food for thought. In response to war, American Quakers have built an international activist community based on their conviction and faith. Since 1917, AFSC members have worked to further human rights by speaking out for pacifism, civil liberties, open borders, equality, and social justice. Theirs is a person-to-person movement, rousing individuals to embody their beliefs and open their hearts to strangers. Whether registering voters in the South in 1963 or sending imprisoned immigrants Valentine’s Day cards in 2017, the AFSC leads with compassion and courage for the good of all humanity. The AFSC unites people with a common purpose to build bridges in communities around the world. Volunteers on the AFSC’s projects become part of a worldwide community of good-hearted people grounded in their shared values and beliefs. Anyone seeking to make a positive difference in the lives of others will find a home among the AFSC.